Ho Ho Ho! 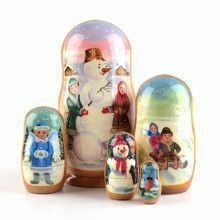 This nesting doll was imported directly from Russia, where it was hand-crafted. Open it up to reveal various depictions of Santa. Makes a great stocking stuffer, Christmas decoration, or an addition to a collection.